If you're looking for a copy of an out-of-print book, I have a few available. Also try large technical bookstores. The links in brackets, like [O'Reilly], take you to a page at that site with more info about the book. You can see a bigger version of most book covers by clicking on them. 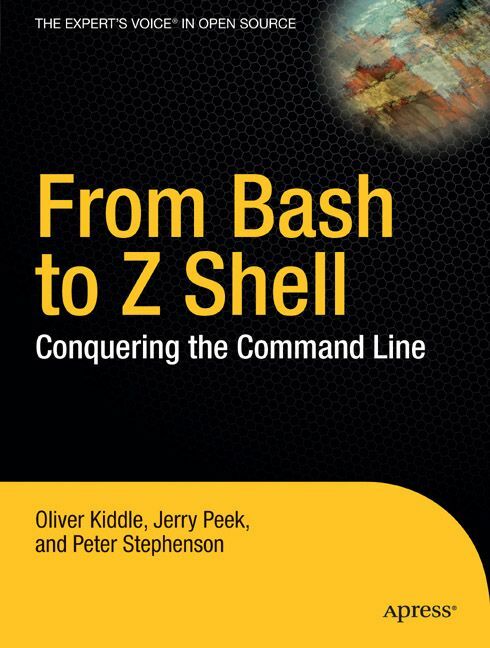 From Bash to Z Shell: Conquering the Command Line (2004) [authors' site], [Apress]. This book shows how much you can do with a shell, the time-tested (and time-improved) command-line interface to Linux, Unix, Mac, and Windows systems. Most shell books emphasize programming the shell, but this emphasizes interactive use. It also covers zsh, arguably the most powerful shell. Learning the Unix Operating System (2002) [O'Reilly]. This short book is not a complete Unix tutorial. It's a brief "how-to" intro for people who need just the basics, enough to get around -- for instance, college students who use a Unix system for email and to store a directory tree full of files. Now in its fifth edition (completely revised from the original 1980s version). There's an introduction in the article Why Use a Command Line Instead of Windows?. The O'Reilly press release has more information and some of my comments. Also available in German [O'Reilly], French [O'Reilly], Japanese [O'Reilly], Chinese (China) [O'Reilly], Chinese (Taiwan) [O'Reilly], Polish [Helion], and Bulgarian [ZeST]. Coming: Portuguese (Brazil). The editions in Greek (1994), Spanish (1995) and Romanian (1996?) are out of print. Unix Power Tools (2002) [O'Reilly]. This is a huge collection of Unix tips and techniques linked together in a sort of hypertext-in-print. It's designed to be read in bits and pieces, in any order. I was first author of the first two editions, and I wrote a lot of the material for the third edition. The O'Reilly press release has more. Here are some excerpts from Unix Power Tools (look for the ones dated Jan/Feb 2000). Earlier editions are available in Russian [BHV], as a two-volume set in Chinese [O'Reilly, O'Reilly] and in Korean [Hanbit]. Learning Unix for Mac OS X (2002) [O'Reilly]. I was second author of the first English edition, which is now out of print. Some of my work is in the second edition [O'Reilly] -- as well as the first editions in Japanese (now out of print) and Italian [HOPS], where I'm still listed as second author. Adapted from Learning the Unix Operating System, this little book is for users of Apple's operating system Mac OS X 10.1. The O'Reilly press release has more information. 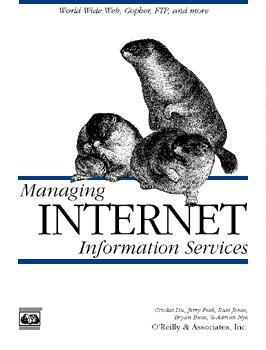 Managing Internet Information Services (1994) [O'Reilly]. This was one of the first books that explained how to put information onto the Internet from a Unix system. Along with the Web, it covers FTP, email, telnet, gopher (which was big in 1994! ), and related topics -- in a two-prong format that's aimed at both techie administrators and "data librarians" who maintain the content. Was also available (but now out of print) in German [O'Reilly], French and Spanish; my part of it was also available as a Japanese book called Setting up an Email Server [O'Reilly]. 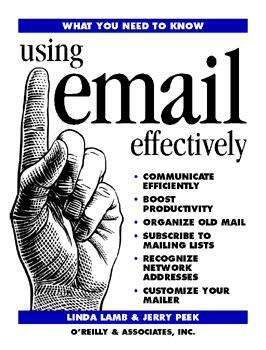 What You Need to Know: Using Email Effectively (1994) [my site] [O'Reilly]. This is not a tutorial on using particular email programs. It helps you get more productive using email, with advice from long-time users on what to do and what to watch out for. This is really Linda Lamb's work; I just did a "brain dump" of a lot of the material. If you read [Polish], you're in luck! It's out of print everywhere else: English, German, and Italian. 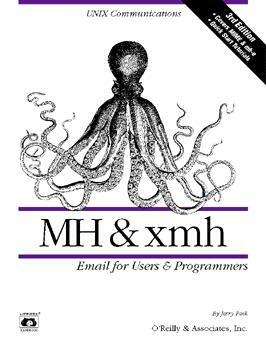 MH & xmh: Email for Users & Programmers (1995) [my site] [O'Reilly] My first book, originally written in 1990. It's about the MH email system, an incredibly flexible package that has run on Unix systems since the late 1970's; there's still nothing else like MH. (The new version of MH is called nmh.) Now out of print after three English editions, you may still find the Japanese edition. There's a freely-available online edition of the book on the Web at http://rand-mh.sourceforge.net/book/. 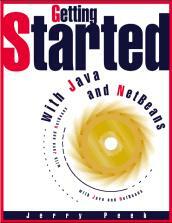 Getting Started with Java and NetBeans (1999) [book is offline now; I have a personal copy]. This book was an introduction to the Java programming language and NetBeans' Developer Java IDE (Integrated Development Environment, for developing Java software). NetBeans was bought by Sun, but the project lives on as free software at netbeans.org.